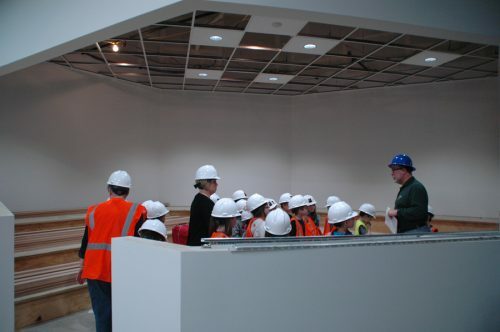 SYRACUSE — Syracuse Elementary students got a sneak peek at their new school in a series of tours held throughout the day Monday, Feb. 20. Buses ferried nearly 550 students to the construction site on Kern Road near CR 1300N, where Wawasee Community School Corp. Superintendent Dr. Tom Edington waited to guide them through the labyrinth of wood, metal, drywall and cement expected to be a fully functioning elementary school by the 2017-18 school year. Already moving along at a brisk pace, a mild winter has further benefited the construction schedule. 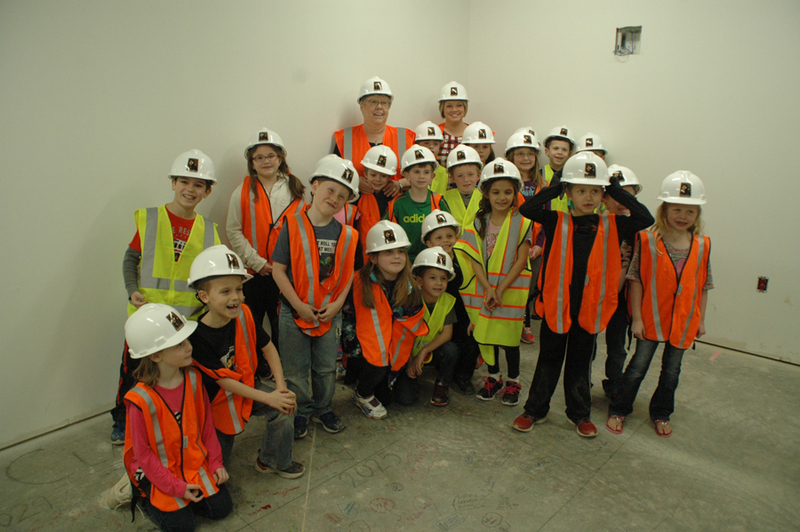 Jamie Martin’s first grade class arrived for its tour around 1 p.m., and after donning reflective orange vests and hard hats they proceeded through the sparkling new boiler room and then into the hallways, cafeteria, music and art rooms, library, offices, gymnasium and the classrooms — four per grade — which radiate like spokes in a wheel from the hexagon-shaped central area housing administrative and health offices as well as multipurpose classrooms. The school was designed around the geothermal heating and cooling system, a first for Wawasee schools. Along the way, Edington encouraged the students to imagine the finished school, and painted a picture of some of the more exciting features. In the library, he pointed out the partially framed-in reading area, which will have tiered seating and a smart board “like a giant iPad” as well as egg-shaped reading chairs. In a multi-purpose classroom students will get more hands-on instruction, working on robotics, for example. In the gymnasium, Edington described the rock climbing wall, basketball courts and bleachers, all yet to be installed. Outside the future bathrooms he encouraged the students to guess which space would be the girls and which the boys. 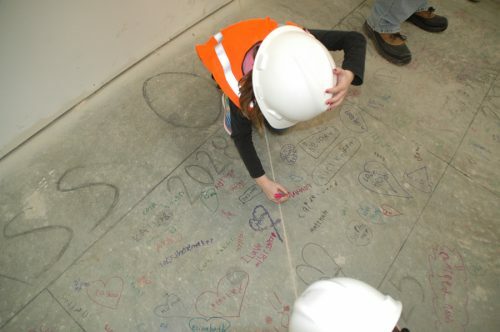 A highlight of the tour was Principal Eric Speicher’s unfinished office, the floor of which is covered with the signatures of students who toured the school. 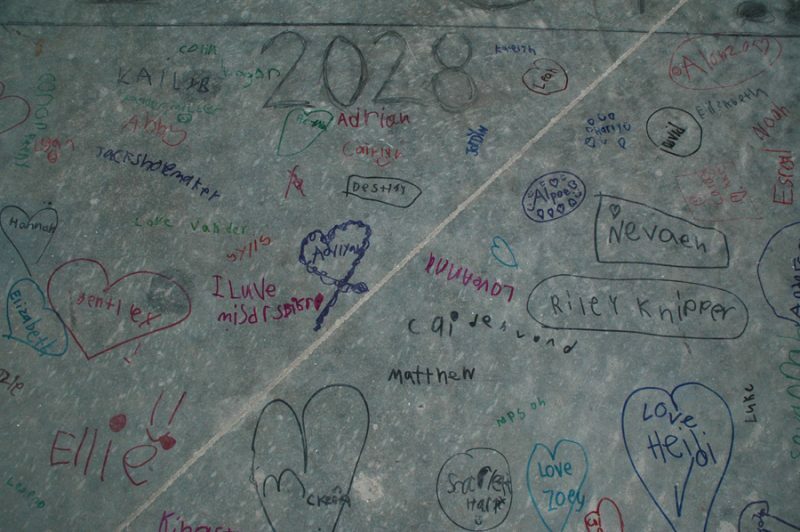 Martin’s class added theirs to the square designated 2028, the year they will graduate. The 550 or so signatures could remain under the principal’s carpet for decades to come. Back outside in the receiving area, Edington had the children imagine pipes 8 feet below where they were standing, which will provide geothermal heating and cooling to their school. The superintendent replied there would be two playgrounds, one for kindergarten through second and another for third- through fifth-graders. Furthermore, a student committee will help design the playgrounds; they will also be involved in the grant writing process to help pay for them. Seemingly satisfied with this answer, the first-graders boarded the waiting bus as another class prepared for a glimpse into their academic future.